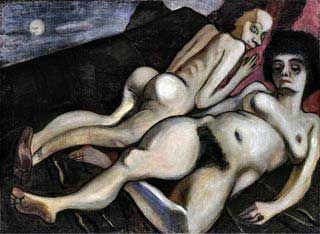 Alice Neel, Nadya and Nona, 1933, at Alice Neel: Nudes of the 1930's, at Zwirner & Wirth. Photo: 16 Miles. In August 1911, an aspiring artist born in Italy stole the Mona Lisa. The whole sordid story is detailed in a new book. In May 1962, André Malraux told Jackie that he would loan it to the United States. Thankfully, according to Jerry Saltz, the Francis Bacons at The Met are enclosed under glass (Bacon's decision). He is not a fan. Smith is more divided. Smith has the best line of the week: "Sigmar Polke is like Robert Ryman, only crazy." If you won't be going to the Alice Neel shows at David Zwirner and Zwirner & Wirth soon, there's a massive slideshow. Selling art from artists' estate makes everyone happy. But Zwirner and Wirth will soon close. Hauser and Wirth will open their first public gallery in America in the current Z&W building: four, fresh floors of art, inaugurated by a recreation of Allan Kaprow's 1961 classic YARD. David Zwirner will show his secondary market program in a new gallery, reportedly across from his 19th Street galleries. It will be called Zwirner. Jacobs by Marc Jacobs for Marc by Marc Jacobs in collaboration with Marc Jacobs for Marc by Marc Jacobs.